Well I just left Delhi and arrived in Hong Kong as part of a long and exhausting buying trip for work. When I travel for business or pleasure, I always enjoy staying in nice hotels. ( My philosophy is why stay in a hotel that isn't as nice or better than your home). And one of the first things I notice is the amazing floral arrangements in hotel lobbies. Asian hotels in particular have arrangements that are over the top. 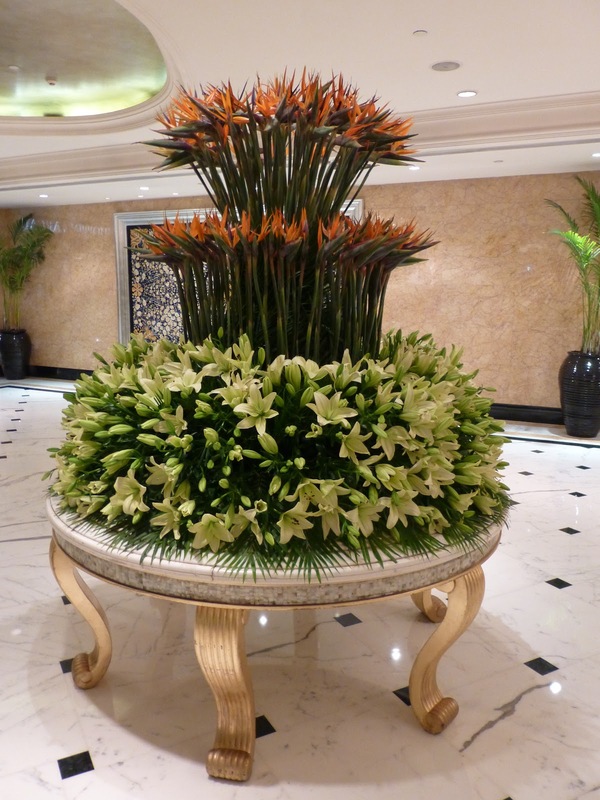 Look at these lilies combined with bird of paradise flowers that were in the Shangri la hotel in Delhi when I checked in. I was only there 2 nights and the arrangement was changed the following day and featured a tower of red and yellow carnations. On a previous trip to Delhi last year, I stay at The Leela Palace - an amazing luxury hotel - and their flowers were over the top. But my favorite flowers in a hotel were at The Breakers in Palm Beach where we celebrated our 25th wedding anniversary. And again , they matched my dress! A luxury hotel and beautiful flowers - 2 of the things I love!